Pasadena Fire Department’s “Pasadena Goes Pink” Fundraising donates over $19,000 to the Jim and Eleanor Randall Breast Center. Children’s Hospital Los Angeles ~ Eleanor Randall and Monica Gambee host a Jackson Pollock Inspired Paint Party for hospital patients. October 6, 2016, is a day that will not be forgotten for many patients and their families at Children’s Hospital Los Angeles. What seemed like an ordinary day, turned into a day of fun, laughter and non-stop smiles for patients as they were given the opportunity to be a kid despite their current medical conditions. Just weeks before this special day, Eleanor Randall and her good friend, Monica Gambee, offered to host a Jackson Pollock-inspired paint party for kids and Eleanor knew that CHLA would be just the place. They thought this would bring joy to the young patients at CHLA, but what they didn’t expect is how much joy they would receive in return. The morning of the party, the canvas was rolled out on the hospital patio, the paint distributed and the Child Life and Expressive Arts Therapy staff alongside Eleanor and Monica, prepared to brighten the lives of children whose days might otherwise be filled with appointments, tests and treatments. As the children picked up their brushes and dipped them in paint, their expressions went from curious, to wonderment to pure delight as they were able to let go of everything else for this one moment and participate in an art experience like none-other. When each canvas was laid, kids waited in anticipation for the “1-2-3-GO!” At the ring of “go” (and often before), paint began flying through the air covering the canvas to create a unique piece of art. There was excitement, anticipation and laughter in the process, as children from toddlers to teens created masterpieces. After the canvases were framed to showcase the masterpieces, they knew what the “next” was. Eleanor and Monica invite others to “come and see” not only the beautiful pieces of art, but to learn about the impact that could be made through additional funding for the Expressive Arts and Therapies Program. A night of hors d oeuvres, drinks and art created by the children showcased like a fine art gallery at the Randall home, not only spread awareness for CHLA but also raised over $400,000 for Children’s Hospital Los Angeles. These special pieces were an expression of joy and excitement and will now bring hope and healing to the patients at Children’s Hospital Los Angeles. Introducing the Jim and Eleanor Randall Breast Center. There’s no better time than during National Breast Cancer Month to recognize the charitable contributions of Jim and Eleanor Randall that are elevating breast cancer care at Huntington Memorial Hospital even further. In gratitude for care received through our breast program, the Randalls recently provided a significant endowment gift to the hospital. The Randall Endowment for Breast Care will help support the broad range of diagnostic, treatment and supportive services available through our nationally renowned, comprehensive breast-care program. We are proud to name the Jim and Eleanor Randall Breast Center in honor of this generous couple. The center brings together high-quality diagnostic and treatment services in a spa-like environment, making cancer care as effective and comfortable as possible for our patients. Click here to read what inspired breast-cancer survivor Eleanor Randall to give back. Learning to thrive after cancer: A new survivorship program for survivors and caregivers. Huntington Hospital’s Jim and Eleanor Randall Breast Center just launched its very first survivorship program that explored cancer-related issues and taught self-care techniques to cancer survivors and caregivers. The 10-week course, taught by a multidisciplinary team of breast experts, addresses an array of topics including: nutrition and supplements, weight management, improving energy and sleep, coping with stress, post-radiation care, and holistic methods of pain control. This is another way we treat the whole patient, not just the cancer. That’s the Huntington difference. For more information, please call (626) 397-2524. What: A mammogram is an x-ray exam of the breast that’s used to detect and evaluate breast changes – helping diagnose cancer in the early stages, before becoming symptomatic. Who: Women should get a screening mammogram every year starting at the age of 40 (earlier if there is a history of breast cancer in your family). When: Annual mammograms should be continued regardless of a woman’s age, as long as she does not have serious, chronic health problems. Why: Death rates from breast cancer have been declining since about 1990, in part due to screening and early detection. Talk to your doctor about getting a referral for a mammogram today! Our physicians attend the San Antonio Breast Cancer Symposium every year to learn about the latest advances in the treatment of breast cancer. This past December, an important study was presented called the SOFT (Suppression of Ovarian Function) trial — the results will change the treatment of premenopausal breast cancer patients. The drug tamoxifen (an estrogen receptor blocker) has been the standard hormonal therapy in premenopausal women with breast cancer for many years. It alone remains an excellent option for lower risk patients, but for women at higher risk of relapse, exemestane plus ovarian suppression is a new standard of care. Click here to learn more. to support ongoing excellence in breast cancer diagnosis and treatment. CLICK HERE to see the dates and times they’re offered. James and Eleanor of the Randall Foundation are Today’s Honorees. James and Eleanor Randall have a long history of providing philanthropic support to organizations that have made a difference in their lives. Through the James & Eleanor Randall Foundation, they support institutions that are dedicated to arts, education, healthcare and mental health – all matters dear to their hearts. Most recently they made a major donation to Huntington Memorial Hospital in Pasadena, California, to support the work and care taking place at the hospital’s nationally renowned breast center. Currently Huntington Hospital’s breast center provides compassionate and innovative care to thousands of women each year. The new Randall Endowment for Breast Care will provide the funds needed to support ongoing excellence in breast cancer diagnosis and treatment within the newly named James and Eleanor Randall Breast Center. The parents of six grown children, James and Eleanor have created a trust that specifically requires their children to continue giving to the community. “We feel it’s very important to give back,” said James. Huntington Hospital receives major donation for breast cancer research. Businessman and developer James Randall and his wife, Eleanor, made a major donation to Huntington Memorial Hospital to support research and treatment of breast cancer, hospital officials announced Monday. The endowment, the amount of which was not released, will result in the establishment of the Jim and Eleanor Randall Breast Center. Williamson said the funds will likely be used for diagnostic and therapeutic services, or be used to coordinate services and help patients with their care needs, pain-management and palliative-care services while offering assistance for families. James Randall has been a Southland businessman since the 1960s, specializing in aerospace rivets and safety equipment. He also has various commercial developments in Industry. 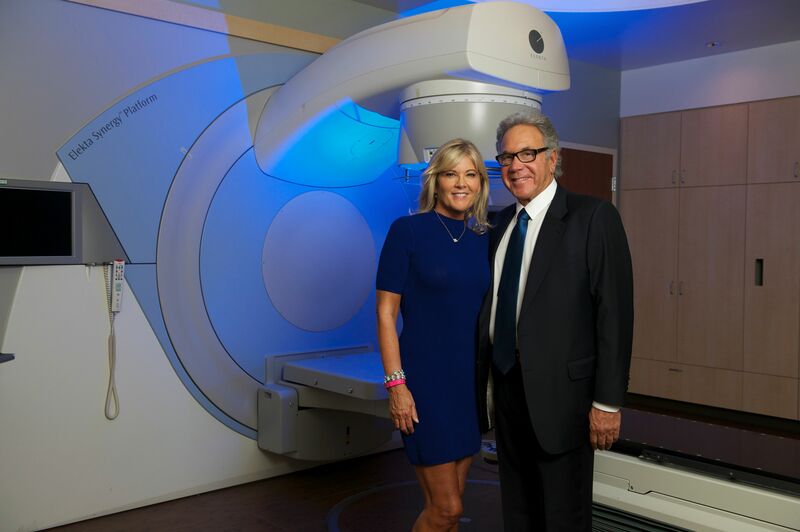 James & Eleanor Randall to support Huntington Memorial Hospital’s nationally renowned breast center (Photo: Business Wire). PASADENA, Calif.–(Business Wire)–As breast cancer awareness month shines a spotlight on one of the nation’s leading healthcare concerns, Huntington Memorial Hospital announced today the receipt of a significant endowment from James and Eleanor Randall to support the work and care taking place at the hospital’s nationally renowned breast center. Currently, Huntington Hospital’s breast center provides thoughtful, compassionate and innovative care to thousands of women each year. The new Randall Endowment for Breast Care will provide the funds needed to support ongoing excellence in breast cancer diagnosis and treatment within the newly named Jim and Eleanor Randall Breast Center. Dr. Williamson explains that the funds may be used to support advanced diagnostic and therapeutic services or to introduce new and advanced care protocols or new technologies. Other potential uses of funds could include care-coordination services to help patients navigate their complex care needs, pain-management and palliative-care services that reduce discomfort and enhance quality of life, support and assistance for patients’ families, dietitian services, leading-edge research that further enhances care, and general upgrades to the Randall Breast Center facilities as needed. Huntington Hospital’s breast cancer program brings together a specialized team of highly trained breast cancer experts – physicians, nurse navigators and other healthcare professionals – who integrate multiple disciplines in a compassionate, comprehensive approach. The hospital’s state-of-the-art imaging means more cancers are found at their earliest, treatable stages when more treatment options are available and survival chances are improved. The hospital’s leading-edge treatments lead to survival outcomes on par with results from university medical centers and research institutes. Huntington Hospital has received the Outstanding Achievement Award from the American College of Surgeons Commission on Cancer. Huntington Memorial Hospital, www.HuntingtonHospital.com, is a 625-bed not-for-profit hospital located in Pasadena, California. It has been ranked nationally by U.S. News and World Report in two specialties and was named among the top hospitals in California. The hospital is on Facebook at www.facebook.com/HuntingtonMemorialHospital and on Twitter at @HuntingtonNews. The Randall Foundation Supports Huntington Trauma Center. James H. and Eleanor Randall are ensuring the availability of lifesaving care close to home, through a generous gift toward expansion of Huntington Hospital’s emergency department and Center for Trauma Care. When Jim and Eleanor Randalll heard of recent emergency room closures in our region including the closure of the emergency room closest to their home in Bradbury they were concerned. The couple have six children (Adam, Beaux, Starlite, Matt, Ben and Jordan), two of whom are still in their teens. “Where would we go if our kids had some kind of traumatic injury?” wondered Eleanor. The Randalls thus approached their good friend Jayme Studenmund (who was serving on Huntington Hospital’s board of directors at the time), and ultimately met with both Studenmund and the hospital’s president and CEO, Stephen A. Ralph, to learn more about the proposed expansion. What they learned impressed them. Indeed, they were moved to make a substantial commitment toward renovation and reconfiguration of the hospital’s emergency department and Center for Trauma Care. Their generous gift will help ensure the continued availability of compassionate, uncompromising care to our region in the most urgent of circumstances. While the Randalls hail from different parts of the continent (Jim was born in New York and raised in Coral Gables, Florida, while Eleanor grew up in Winnipeg and Toronto, Canada), the two met while living in Southern California. More recently, as the children got older, she began looking for an additional outlet for her energy and creative talents. “I decided I needed to do something different …something outside my comfort zone …and then, as I came out of the grocery store one day, there was a flyer on my windshield, advertising art classes,” she recalls. “I’d never even doodled in my life, but I started the classes and, to my surprise, I loved it.” Today an accomplished artist, Eleanor’s large scale oil works include a series of aircraft paintings, on display at Allfast, and a large mural sized painting created for the University of Southern California School of Social Work. She is currently working on six pieces that will be hung in Mt. San Antonio College’s refurbished planetarium. The Randalls have made significant contributions to both these latter organizations, creating the Randall Information Center at USC School of Social Work (a student resource center made possible by support from the Randalls), and the Jim & Eleanor Randall Planetarium at Mt. San Antonio College. Both Jim and Eleanor serve on the board of directors at Mt. San Antonio College Foundation. They have also been involved on the board of Flintridge Preparatory School, where the Randall Performing Arts Center is named in honor of their contribution toward expansion of the school’s arts program. At San Gabriel’s Clairbourn School, the couple’s generosity led to creation of Randall Hall, which houses a play area and classrooms for younger students. The Randalls continue to set a philanthropic example honing in on areas with broad and potentially life changing importance, such as education, mental health and now emergency care. Ultimately, notes Eleanor, “We chose to make a gift toward expansion of Huntington Hospital’s emergency department because the project touched our hearts. We were shocked to hear that all the other trauma centers in our region had been closed,” she adds, “and that Huntington Hospital was the only one nearby:” Should Huntington Hospital not be able to meet our region’s needs, it would mean a long ambulance ride to a more distant facility at a time when every second could make a life or death difference. “We wanted to make sure there’s a place for people to go right here… that they weren’t going to die on the way to the hospital,” Eleanor emphasizes. The Jim and Eleanor Randall Foundation Support USC’s School of Social Work. On March 22nd the University of Southern California, School of Social Work honored the Randall family at a reception for the grand opening of the new Randall Information Center, a center made possible by a generous gift from the Jim and Eleanor Randall Foundation. The Randall Information Center, located in the School of Social Work, “offers students computer access to electronic research tools, including library databases and catalogs, group study areas and a social work librarian”. USC commissioned Eleanor Randall to create the above artwork. It represents the cultural diversity that the USC School of Social Work offers and is located in the Randall Information Center. Four years ago, James and Eleanor Randall took a tour of Childrens Hospital Los Angeles and were immediately taken with the quality of care and dedication of the hospital’s staff, from the Newborn and Infant Critical Care Unit (NICCU) to the Chase Place Teen Lounge. “It was obvious from the moment we entered the lobby that Childrens Hospital was an exceptional hospital,” says James. The tour prompted the Randalls to make a generous gift through their foundation, The James and Eleanor Randall Foundation, to fund a private patient room in the New Hospital Building’s NICCU. They recently made another significant gift to pay for an examination room in The Maurice Marciano Family Foundation Emergency Department and Trauma Center in the New Hospital Building. Their contributions make them members of the First Families Legacy Program, which recognizes individuals and families who make a gift of $100,000 or more toward the New Hospital Building’s construction. “Since our first gift, we have been keeping up with all of the hospital’s latest advancements and have been impressed with the progress Childrens Hospital has been making as a leader in pediatric medicine. The hospital needs our support and we are happy to be a small part of that support,” adds Eleanor. The couple’s foundation, created in 1997, has given generously to support arts, education, health care and mental health organizations. In addition to Childrens Hospital, the Randalls have made charitable gifts to the University of Southern California (USC) School of Social Work, Mt. San Antonio College, Flintridge Preparatory School, Clairbourn School, Huntington Hospital, Chapman University and Pepperdine University. James is president of Allfast Fastening Systems, Inc., the world’s leading manufacturer of rivets and related installation tooling for the aircraft industry. The company holds 18 patents and supplies clients in more than 30 countries. He is also a major developer of industrial commercial buildings in the City of Industry, where Allfast is headquartered. Eleanor is an accomplished artist whose large-scale oil and acrylic works are on exhibit at Allfast’s headquarters and the USC School of Social Work, and soon to be on display at Mt. San Antonio College’s refurbished planetarium. She also is involved in producing Allfast’s advertising and marketing materials. Before starting her art career, Eleanor modeled and appeared in more than 150 television commercials. The Randalls, who participate on several boards throughout Southern California, have six adult children and two grandchildren and divide their time between homes in Bradbury and Malibu.